A visual control can take many forms. Simple Kanban boards and complex product management systems are examples of visual controls. In software development, there are two predominant levels of visual controls. One is at the team level, the other creates visibility across the technology group. Common team level visual controls are Scrum and Kanban boards. The following figure shows a technology wide visual control. Dependencies any PBIs have with each other. Consider releases, MBIs being ready, and dependencies as agreements about having them ready by the specified date. Making and keeping these agreements is one way of changing the culture of collaboration in an organization. Although we mentioned the preponderance of team and technology wide visual controls, it is possible to have them across the entire organization. Each control will have a different level of granularity and purpose. Figure 2: Visual controls across the enterprise. Potential Business & Systems Capabilities. This holds potential work, often in the form of initiatives. MBIs. 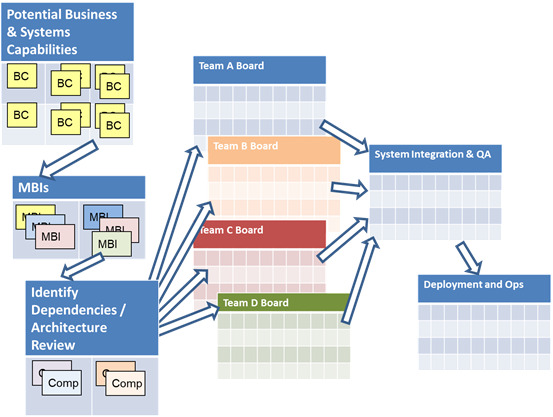 This board starts with MBIs that are not well-defined and ends with MBIs that are ready to be pulled. Identify Dependencies / Architecture Review. This board is sometimes integrated with the MBI board preceeding it. It is only required as a separate board if the MBI is going to be split up along the development group lines. Team boards. These are the teams’ Scrum or Kanban or Team-Agility boards. System Integration and QA. This board is only needed if integration and QA is done separately from the teams. Deployment and Ops. This board contains work that has been completed but not deployed. The following is a paraphrase from Creating a Lean Culture: Tools to Sustain Lean Conversions by David Mann. Alignment is critical. This requires both what we’re all working towards and how we work together towards that. The true difficulty in transformation is not in knowing what to do but in changing the way people think and the practices they use. Changing mindset is difficult. While the practices themselves are fairly simple, getting rid of ingrained habits is not. Visual controls can reinforce the new required behavior by providing information people need and reminding them of the agreements they have made.